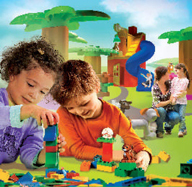 Parkin Architects Limited is the architect of record for Canada’s first Legoland, to be constructed in Vaughan, Ontario. The 34,000 sq. ft., $12 million centre will be a highly interactive and educational facility, geared towards children aged 3 to 12 years of age. Included will be a unique Miniland exhibit, showcasing iconic buildings and the Toronto skyline. The centre will be open to the public in the Spring of 2013.